check out our castle for FAIRY TALE week! The kids did so great labeling all the things! I picked up the brick and stone papers at a local teacher supply store! Take a look at this STEM activity! I just created a castle with magnetic tan gram pieces, traced them with a sharpie on the white board and then bagged up the correct pieces, numbered the bag and the board, then put them out as a challenge! The kiddos did great! Remember to use the code JAMIEBONKERS when you begin your new ESGI trial!!!! 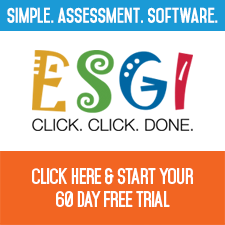 There are great contests happening and super fantastic savings if you sign up for ESGI today! Check out our video below to see how we teach nursery rhymes in our classroom! We love interactive retells and recites! Welcome to School Dramatic Play! ​Below is one of my MOST FAVORITE dramatic play transformations! We always have a huge Bakery Unit in February and this year was no exception! I did make a change in 2018 though, I printed the adorable Bakery Dramatic Play set from the wonderful Jennifer Horner's TPT store! Check out all of her items! She does some amazing stuff! We are a 5 and 1/2 hour program. Below is the basic layout of our day, but detailed info about our Math Moments and Literacy Love will in upcoming posts.